New York : W W Norton, 2012. Describes the impact that the translation of "On the Nature of Things" by Roman philosopher Lucretius had on history, inspiring artists, great thinkers, and scientists of the fifteenth century and fueling the beginning of the Renaissance. Every page of the book strives to present the Renaissance as an intellectual awakening that triumphs over the oppressive abyss of the Dark Ages. The book pushes the Renaissance as a rebirth of the classical brillance nearly lost during centuries mired in dullness and pain. This invention of modernity relies on a narrative of the good guy defeating the bad guy and thus a glorious transformation. This is dangerous not only because it is inaccurate but more importantly because it subscribes to a progressivist model of history that insists on the onward march of society, a model that allows moderns like us to excuse our crimes and injustices because “at least we’re better than those medievals.” Now unlike most of those thousands of innocent believing readers, I see the deep problems of such an approach, as have the last dozen generations of historians. History does not fit such cookie-cutter narratives. Having studied medieval culture for nearly two decades, I can instantly recognize the oppressive, dark, ignorant Middle Ages that Greenblatt depicts for 262 pages as just… fiction. It’s fiction worse than Dan Brown, because it masquerades as fact. Benedictine order in the eleventh century, making voluntary self-flag­ellation “a central ascetic practice of the church” and thus accomplishing the thousand year struggle “to secure the triumph of pain seeking” (107). If this is genuinely how Green­blatt understands the significance and nature of the Benedictine order, one can only wonder why Harvard retains him. Why Stephen Greenblatt is wrong and why it matters. Greenblatt's story of the unleashing of the pleasure principle on the European world after the discovery of Lucretius conveys his own passion for discovery, and displays his brilliance as a storyteller. The Swerve is, though, a dazzling retelling of the old humanist myth of the heroic liberation of classical learning from centuries of monastic darkness. The light of Rome fades into gloom, sheep graze in the Forum; then the humanists rebel against the orthodoxies of the church, bring about a great recovery of classical texts and generate a new intellectual dawn. This book makes that story into a great read, but it cannot make it entirely true. The ideas in “The Swerve” are tucked, cannily, inside a quest narrative. The book relates the story of Poggio Bracciolini, the former apostolic secretary to several popes, who became perhaps the greatest book hunter of the Renaissance. His most significant find, located in a German monastery, was a copy of Lucretius’ “On the Nature of Things,” which had been lost to history for more than a thousand years. Its survival and re-emergence into the world, Mr. Greenblatt suggests, was a kind of secular miracle. Approaching Lucretius through Bracciolini was an ingenious idea. It allows Mr. Greenblatt to take some worthwhile detours: through the history of book collecting, and paper making, and libraries, and penmanship, and monks and their almost sexual mania for making copies of things. The details that Mr. Greenblatt supplies throughout “The Swerve” are tangy and exact. This concise, learned and fluently written book tells a remarkable story. It may not quite tell us "how the Renaissance began", as the subtitle rather rashly promises, but the episode it describes is certainly resonant. Highly skilled, close-focus readings of moments of great cultural significance are Stephen Greenblatt's speciality, whether in "new historicist" studies such as Marvellous Possessions, about the European encounter with the New World, or in his more populist biography Will in the World: How Shakespeare became Shakespeare. The Book Report: De rerum natura was a long narrative poem expounding Epicurean philosophy that was written in the first century before the common era. I am told by those possessed of sufficient Latin fluency that it is beautiful. I am not possessed of that level of fluency, and to me it seemed agonizingly impenetrable and obscurantist. But author Greenblatt, in this fascinating Pulitzer Prize-winning history and analysis of the poem and its influence on the world, focuses not on the merits of the poem but on the genesis, development, survival, and influence of De rerum natura, arguably the foundation text for the mental construct that you and I share, and that diverges widely from the mental construct of earlier times. Why is this so? Because we accept a material explanation of the existence of things as our prevailing orthodoxy, even in the face of religious challenges to the primacy of logic and evidence and just plain good sense. It's down to Lucretius's poem's astounding clarity of thought, persuasiveness of rhetoric, and miraculous survival and rebirth. What Greenblatt did was to provide a brief history of Epicurus, his actual philosophy, and the cultural currents that distorted and misrepresented his philosophy, together with the whys and wherefores of that misrepresentation. Then Lucretius, a shadowy figure whose biography is unknown to modern readers except for a calumny heaped on his memory by a man who did not know him and in fact lived centuries after his death, wrote in poetry...a form of expression not to Epicurus's taste or, in his opinion, a good and useful tool of communication, he preferring plain and simple and direct prose...broke down the Epicurean vision of the world, and argued in support of it. Greenblatt then traces the survival of manuscripts from antiquity to the Middle Ages, the resurgent interest in their contents during the run-up to the Renaissance, and the incalculably valuable role of obsessive individuals in hunting down, copying, and disseminating the surviving antique texts to a world then, as now, hungry for more and better and different views and experiences and thoughts and ideas. My Review: I give this book one of my rare five-star ratings because it has solved a problem of identity for me: I am, as Thomas Jefferson said before me, an Epicurean. Not the debased view held of that noble philosophy thanks to “Saint” Jerome, who in the course of ramming his ignorance-celebrating religion down the throats of humanity, hit on the perfect misstatement of Epicurus's actual materialist philosophy: Hedonism! Hedonism and vice and licentiousness and gluttony! The pursuit of pleasure can only mean these things, shouted Jerome, and the chorus of baying dogs was off after the fox. --The elementary particles of matter...are eternal. --The elementary particles are infinite in number, but limited in shape and size. --All particles are in motion in an infinite void. --The universe has no creator or designer. --The swerve is the source of free will. If there is no preordained pattern, how can there be a preordained result? --Nature ceaselessly experiments. Evolution by natural selection, anyone? --The universe was not created for or about humans. --Humans are not unique. We are animals, literally not figuratively, like all the others. --Human society began, not in a Golden Age of tranquility and plenty, but in a primitive battle for survival. --The soul dies. There is no afterlife. --Death is nothing to us. It is merely a fact. There is no personal component to death. --All organized religions are superstitious delusions. Religions are, invariably, cruel. --There are no angels, demons, or ghosts. --The highest goal of human life is the enhancement of pleasure and the reduction of pain. --The greatest obstacle to pleasure is not pain, it is delusion. --Understanding the true nature of things generates deep wonder. I have never seen in print or heard with my ears a clearer, more concise, or more complete statement of my own personal worldview than this. It rang me like a bell. It sounds like Lucretius was sitting inside my head and copying down my responses to the world. In the brief explications Greenblatt attaches to the bullet points, he makes it clear that these ideas, while they never wholly vanished from the world, were seen by the dominant world-view as a challenge to the idiotic legendary nonsense that had come to replace them, and were thus strongly condemned, to the point of burning people alive as a punishment and a warning to others inclined to think for themselves, to view the world as it is instead of through a warped fantasy construct that demonstrably causes harm and pain and facilitates much evil-doing. So on that basis...five stars, and a ringing huzzah, to Gentile Signor Poggio Bracciolini; to Greenblatt for digging deeply enough in the humus of scholarly debate and historical records to make these connections for us, in a less scholarly age than the Renaissance, to find and use for ourselves as we see fit (ie, to exercise the free will we've got); and to WW Norton for publishing the resultant text as an under-$30 course in humanism. I am also grateful to the Pulitzer Prize board for awarding this book its non-fiction encomium, and to the Catholic News Agency for remaining consistently wrong by grousing about the book's anti-Catholicism and misinterpretation of the Church's anti-intellectualism. It's kind of hard to misinterpret burning people at the stake, guys. Own up: Your religion requires ignorance and prefers stupidity in its adherents. 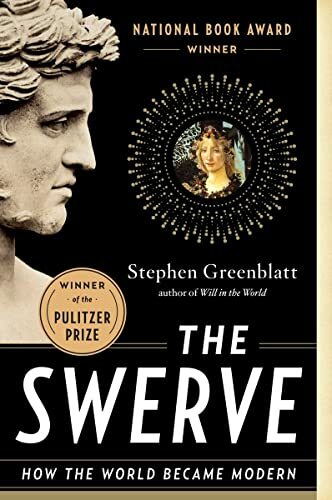 The Swerve: How the World Became Modern by Stephen Greenblatt, is an intellectual romp. It tells the tale of the creation of Roman Lucretius's revolutionary, non-conformist poem On the Nature of Things, its ties to Epicurus and Epicureanism, its loss for centuries and then finding in the 15th century by a fascinating book hunter, its gradual dissemination and then growing influence on artists, writers, philosophers and political leaders, the attempts at suppression, and the curious schizophrenic reaction of the many Christians who loved it as a poem but denounced its content. Sounds a bit Homeric, doesn't it? And from that you wouldn't guess what it proceeds to divulge, an extensive, clear-eyed, scientific, anti-religious world view remarkable in both scope and detail. The references to Gods and Goddess certainly are surprising, given what we come to understand about the poem. What follows might be a little SPOILERY, but there's so much in this book, I think it will only help you get grounded a bit. In a chapter titled, "The Way Things Are", Greenblatt explains the ideas in Lucretius's poem in a way I can only urge you to read. Some examples: "Everything is made of invisible particles." Going back to Greek ideas, Lucretius sees our universe as being made of tiny, eternal, uniform particles that combine in different forms and eventually dissolve into their original state only to combine again into new forms. Yup, atoms. From this he reaches many dangerous conclusions, including that "The universe was not created for or about humans", and "All organized religions are superstitious delusions." You can see why this would cause a ruckus among devout believers. To boot, "Religions are invariably cruel." Hmm. He of course has some basis to say that, and seems to get some unfortunate vindication after we read about the double-crossing torture and death inflicted by the church's leaders in the 15th century against those espousing contrarian views. So what's it all about for us? "The highest goal of human life is the enhancement of pleasure and the reduction of pain," and "The greatest obstacle to pleasure is not pain, it is delusion." At times I found myself thinking, this guy is a Buddhist! :-) Substitute in as the highest goal "experiencing the moment and the absence of suffering" and it seems like a pretty darn Eastern view. Lucretius found his foundation in Epicurus's ideas (which turn out not to be what we think they are). Among the many pleasures of this book are following book hunter Poggio, who actually was a deftly successful secretary to several Popes in Rome (his low point comes when his Pope, during a time of multiple Popes, gets dismissed and imprisoned). Among the depressing skulduggery, Poggio's refuge was books, and his greatest enjoyment was traveling to monasteries and discovering ancient manuscripts thought lost forever. In 1417 he finds Lucretius's poem and eventually transcribes it. All copying was by hand back then, and Poggio's script was renowned as a beautiful one. Gradually the poem gets hand-copied by more and more people (including, eventually, Machiavelli!) and its influence spreads. Botticelli, Leonardo DaVinci, Montaigne, Moliere, the list goes on and on. Lucretius's poem was even a favorite of Thomas Jefferson. The suppression and oppression is sobering and fascinating, but the "I love it, I hate it" effect on devout Christians is often very funny. One Jesuit order had an "anti-atom" prayer they had to recite every day. One writer who did a popular translation of the poem and also "refuted" it, said, "even though the poem itself is alien to our religious beliefs, it is no less a poem . . .an elegant poem, a magnificent poem, a poem highlighted, recognized and praised by all wise men." With time, the unsuccessful attempts at suppression became even more difficult: "As Thomas More discovered when he tried to buy up and burn Protestant translations of the Bible, the printing press had made it maddeningly difficult to kill a book." Stephen Greenblatt is the main proponent of New Historicism, the branch of literary criticism which argues that a literary work must be studied and interpreted while analyzing the history of its author. In contrast with Historical Criticism, which only aims to demonstrate how a work rflects the time in which it was created, New Historicism "evaluates how the work is influenced by the time in which the author wrote it. It also examines the social sphere in which the author moved, the psychological background of the writer, and the books and theories that may have influenced him or her. Beyond that, many critics also look at the impact a work had and consider how it influenced others." In The swerve. How the world became modern, Greenblatt applies the principles of New Historicism to the evaluation of De Rerum Natura by Lucretius. The description of the life and ideas of its author, the social circles he (may have) moved in, particularly describing the history of the Villa of the papyri in Herculaneum make for very interesting reading. There are descriptions of the history of books, and an extensive biography of the Renaissance notary Poggio Bracciolini and how he rediscovered the single extant manuscript of De Rerum Natura in a German monastery in 1417. Subsequent chapters describe the significance of the text and its impact, particularly in terms of the transition from the Middle Ages to the Renaissance, suggesting that it was the cornerstone to the development of the modern world. It is at this point that Mr Greenblatt seems to be overplaying his hand. The conclusion that Lucretius' De Rerum Natura hold the key to the development of the modern man implies that this development could not start until after the discovery of the manuscript in 1417. This conclusion in clearly wrong. Common knowledge sees the beginning of the Renaissance in the early 1340s with Petrarca. Rather than suggesting that De Rerum Natura was a contributing factor, or katalysator of a movement which had already begun, Greenblatt's book suggests that Petrarca was a precursor of that movement. Other authors of political movements, such as the revolt of the Ciompi in 1378 are marginalized and downplayed. The most important omission is the revolt of Cola di Rienzo in 1347, which suggests that Greenblatt is selective in his choice of sources and facts to the extent of distortion or oversimplification. Long before Poggio Bracciolini expeditions to hunt for ancient texts, Francesco Petrarca and Giovanni Boccacio were contemporaries and friends who collected and studied ancient texts. The swerve. How the world became modern has many characteristics of a work of popular science. Sources and references are not noted in the text, but listed as end notes, however, without clear reference in the text. Although not exlicit in the text, the book suggests that a the turn from the Middle Ages to the Rennaisance can be pinpointed to a particular year, and even a particular moment, namely the moment Poggio picked up the book from the shelf. This type of suggestion is very reminiscent of recent history bestsellers such as 1434: The Year a Magnificent Chinese Fleet Sailed to Italy and Ignited the Renaissance by Gavin Menzies. A very disappointing book. It concentrates strongly on the find of the manuscript by Poggio and details a great deal of his life but all with a tendency to pop history. This becomes more marked when he moves into classical, late antique or medieval history when you can either not rely on his history or will find he is very, very selective of factoids which support his case. I would have liked more of an enthusiastic coverage of Epicurus ideas, and of On the Nature of Things as a work of literature and philosophy. Instead we get a few potted facts. A work like this should send you off wanting to read the original work. This is a great book to learn some history in an enjoyable way. We learn about about the time of Lucretius back with Julius Caesar and that gang. We learn a little about the centuries from then up to the Renaissance, when book culture got rather thin. We learn quite a bit about Renaissance times - our hero is Poggio, who recovered the poem of Lucretius but was also secretary to five popes. Then we learn a bit about the spread of atomism and epicureanism, through Bruno and Montaigne to Jefferson. For my taste, this book has too strong a flavor of scientistic triumphialism. It reads like a Dawkins screed. Some years back one of my coffeeshop pals wanted to read some Bruno, thinking that Bruno was a great pioneer of science. Well, if you dig into Bruno, it's not that simple! Greenblatt admits that Epicurus himself was an odd type of epicurean, i.e. not any extreme hedonist but adhering more to the wisdom of moderation. So I think the book is OK on history, but shallow philosophically. And really you can dig deeply into the history of philosophy without digging into the philosophy. There is a much richer tapestry here and Greenblatt is picking his path to make a simple story. Ah, it was in an Oscar Wilde essay, Critic as Artist or something like that.... Wilde discusses Bruno as a satirist and his indebtedness to the Hellenic satirist Lucian. Go read Lucian! It's a total blast! Lucian has some stories about travels to the moon, etc. Remarkably modern! But here is also the revival of the skepticism of Pyrrho and Sextus Empiricus. Yeah we hear more in this book about the horrible tortures by the church as it suppresses any kind of nonconformity. What we get here is too much of a tale of good and evil, the good guys and the bad guys, for my taste! It's too polemical and too shallow. If you don't like depth and mystery, you'll probably like this book! All in all, I'm glad I read this book because I learned a lot about Epicureanism, humanism and book production in the pre-printing press days. It was also an interesting story of the life of Poggio, the book hunter who finds an obscure ancient poem that, argues the author, made a significant contribution to the renaissance. Greenblatt tells the story of the preservation of a philosophical text book by Lucretius, a Roman epicurean. The book was held in the library of a German monastery in the 1300s and was identified by a papal secretary, Poggio. Poggio had copies made, and the text became broadly circulated. Greenblatt makes the point that some of the views put in the text, that life goes on without input from the gods, for example, found fertile ground at the start of the enlightenment, in spite of the obvious objections of the Church hierarchy. I read a lot of negative reviews of this book prior to buying it. I figured: Typical reactions to a book about Epicureanism and its partial revival upon the Renaissance discovery of Titus Lucretius Carus's masterful didactic poem ON THE NATURE OF THINGS. And I was right. This is a fun book. The author provides a portrait of the age that moderns forget: Just how pain- and death-obsessed Dark Ages Christians were. Horrifying. Every time I read a conservative defense of medieval Christianity, I want to retch. This book is, in part, a good antidote to such nonsense. The author, contrary to many of his critics, does make a case for the book's influence. And it's not a bad case. It was one of the crucial sparks to light the fires of both the Renaissance and the Enlightenment. It had subtle influence. And some not so subtle influences on writers like Michel de Montaigne. This book has a somewhat polemical purpose, as is apt for a book about the Epicurean revival. Epicurus always wrote with a sense of purpose: to extinguish fear from readers' souls. Christian Europe, prior to the Enlightenment, was a horror, and Christianity fed the fires of fear: Fear of "the Lord"; fear of punishment in the afterlife; fear of persecution, torture, and execution. Modernity was a necessary way out of Christianity's horrible death grip on the minds of Europeans, rich and poor, educated and ignorant. Coming late to the game with all the hype about this book, I was a bit disappointed with it. Some of it is probably due that I have always hated Lucretius' De rerum natura. Facts are best presented in prose not in rhyme. The life of Poggio Bracciolini serves as the background for a sweeping portrait from antiquity to the renaissance with one digression after the other so that the final pages have to rush to present Bracciolini's actual life and career. There it is revealed that the supposed monumental find of Lucretius' work was actually kept under wraps for many years by one of his acquaintances so that the key thrust of the swerve collapses like a bad soufflé. The pleasure of reading and discovery take another dimension in this beautiful and exciting book: You witness a man's passion for the times long gone, for the literature lost in the past, for the dangerous ideas buried within the shelves of the libraries of hard to reach monasteries. The man in question is the famous Italian humanist Gian Francesco Poggio Bracciolini. He is the one to discover the only surviving work of the great Roman poet and philosopher Titus Lucretius Carus. Thanks to Poggio, we can enjoy "De rerum natura" (On the Nature of Things), about 2000 years after it had been written. The book's title is a little misleading: do not expect to learn about many aspects of the Renaissance in all its glory. But rather be prepared to engage with the personal history of a man who brought us back one of the greatest poets from the dead. As you learn more and more about the times of Poggio, and the cunning atmosphere in which he worked as a papal secretary, you also get to know about the Lucretius, and how his poem conveys the core ideas of Epicurean philosophy. As expected, there's a huge tension between those ideas and the Christian way of life, and it'll probably make you smile reading the accounts of various translators; how they appreciate the glorious language of Lucretius while at the same time repeating how they are hundred percent against the ideas laid out by the great poet, because, you know, they are good Christians, and also, nobody wants to mess with the Catholic Church, especially during the period of 15. to 18. centuries (because, you know, being burned at stake is not a very Epicurean way to go). The title of this book bothers me, as does the comment "A riveting tale of the great cultural "swerve" known as the Renaissance." The book is actually about the rediscovery in the 15th century of "On the Nature of Things" by the Roman Epicurean philosopher Lucretius. The "Swerve" refers to one translation of one of the fundamental aspects of the atom-based concepts promoted in the poem. Yes, Lucretius believed in what we today call atoms, or really, elements, or maybe really protons, neutrons and electrons. He also had the basic ideas of natural selection worked out, and what we would consider a more modern view of the cosmos. The "swerve" is a translation of his variety of what we might call atomic level chaos theory. The book is pretty good stuff. It's overly dramatic, but Greenblatt looks closely into the world of books and monasteries in the 15th century and how they got there, at the political world of the Popes, early humanists, and one momentarily out-of-work scholarly humanist, Poggio Bracciolini, who found a copy of Lucretius in a still unknown but likely isolated monastery. Then Greenblatt has to somehow deal with what I would consider several plot obstacles in that Poggio never really did anything with Lucretius, and that almost no authors could directly acknowledge influence of Lucretius since his ideas are so far outside the Christian, and especially Catholic, concepts of the times. So Greenblatt looks for anything he can find on atomic theory and claims it is either a reference to Lucretius or influenced by him. I was sometimes skeptical, and felt Greenblatt way overstated Lucretius's influence on the already underway Renaissance. But still this was enjoyable and worth pondering. This is one of those "Be careful what you wish for, because you just might get it," moments for me. After finishing John M. Barry's excellent THE GREAT INFLUENZA I was in the mood for something shorter and broader. Something closer to my usual wheelhouse but, I hoped, still exciting. And here was this Greenblatt book, with it's shiny National Book Award and 12 hour unabridged running time. As it turns out, however, THE SWERVE was too broad and too familiar for me to enjoy. Here's the central thesis of the book: the modern world is made possible by a focus on our earthly existence in the material world instead of the afterlife. And, Greenblatt further argues, the switch from a religious and pain-centric "life is prelude" paradigm to the Renaissance's burgeoning fascination with the material world can be traced, at least in part, to the rediscovery of the Epicurean poet Lucretius' work, ON THE NATURE OF THINGS. A more interesting, and somewhat more nuanced, thread runs through the book, namely: what is morality without fear of the afterlife - is a "good life" inherently moral - basically, how do atheists orient themselves in a moral universe. Greenblatt starts by pointing out that Epicurus himself defined "pleasure" in surprisingly moral terms - simple and rustic, full of friends and ideas, far from excess, luxury or power. On the other hand, the character that we spend the most time with is Poggio Bracciolini, a Renaissance scholar who Greenblatt repeatedly characterizes as a terrible hypocrite and all around jerk. Anyway, the ideas are interesting enough for, like, at least one good late-night convo at a coffee house but really THE SWERVE is a book full of vast generalizations. Greenblatt plays with his big ideas, exploring none thoroughly. I don't feel like I have a better understanding of the medieval world, ancient Greece or Rome, or the Renaissance than I did before...which, hey, no surprise, because those are some pretty vast subjects and this book was of moderate size. I listened to the audiobook. I suspect I would have gone nuts if I'd tried to actually read it, and that I'd be much angrier. Instead, I feel like I got about as much exposure as I could handle - though I absolutely loathed the voice of the narrator, which I found portentious and, whenever he read a quotation, weirdly mocking. For the first time I can remember, reading LibraryThing reviews has affected my opinion of a book. Many of the lower-rated reviews here seemed to confirm my suspicions about "The Swerve," so I'm knocking off half a star. It's not that Stephen Greenblatt's "The Swerve" isn't enjoyable: it is. The writing is fluid and the story that Greenblatt puts together is compelling: it's a page-turner about manuscript hunting. The problem is that I feel he's worked a bit too hard to make Poggio Braccolini a hero for our age, a modern secular humanist avant la lettre. I suppose that people that write history books have to balance their desire to make the past seem familiar with their desire to make the past seem like a strange and exotic place, but I feel that, in accentuating his modern tendencies, the author has probably pushed his comparisons between his subject and the way we think today a bit too far. It's not that Poggio wasn't modern, it's that he may not have been modern in the exact same way that we are. As a non-religious citizen of a 21st century democracy of liberal political sensibilities, I felt that "The Swerve" pandered to me in ways that I can't put my finger on, and that's not really a good thing. A collection of very interesting topics (search for books, outpouring of the Renaissance, the foundation of modern Humanism, the poem itself) which somehow does not hold up together.